As a bookseller you get sent literally hundreds of reading copies from publishers on a yearly basis so you get very good at choosing which books you will read and which ones you won’t. I’ve just come back into the industry after a ten year break. As a result my reading pile has gone from a very manageable 4-5 books that I planned to get around to at some point to a towering pile of “I have to read these now”! When Jane Harper’s debut novel, The Dry, turned up in the mail I looked at its bright red cover with the bold claim that it was one of the best books of 2016 and thought- I’ve got at least three other books in my pile claiming exactly the same thing. Then I opened the cover because I wanted to know – was it true? I shouldn’t have started it because Jon was already reading it and it wasn’t my turn. I only planned to read the first couple of paragraphs. Except that I didn’t. Because I couldn’t stop. So I read 4 chapters and when Jon found out I was in big trouble!! Then we had to negotiate…. it got messy. We took turns. Aaron Falk returns to farewell his childhood friend but he’s not welcome. His family were run out of town when Aaron and Luke were just kids and he’s never been back. Questions surrounding a 20 year old suicide and Falk’s part in it are reignited and an already tense situation becomes a tinderbox. The community is split and those who wish Faulk gone are not shy in making their opinions felt. All he wants is the truth and in finding that to maybe bring comfort to Luke’s grieving parents….and to himself. Yet finding the truth among so many secrets and lies is never an easy thing. Jane Harper vividly portrays the harshness and beauty of the Australian landscape and the small-town prejudices and petty grievances which escalate under the unrelenting Australian sun. The twists and turns will leave you in turns gasping from surprise and then in anticipation as each time you think you have it all worked out and you realise you don’t. This is a page-turner in the truest sense of the word. You will not be able to put this book down. The Dry will be one of the best books of 2016. This book needs to come with a warning. Make that two warnings. First, once you start this book you will not be able to stop. It is totally addictive. The last book I tore through like this was Gone Girl and The Dry is it’s equal in nearly every way. The second warning this book needs is that people are going to steal it off you. Twice while reading this book I had the book taken from me and twice I had to pry it out of those people’s hands to get it back (deals were done, promises made, all in an effort to get the book back!). There is already a huge amount of hype around this book. It won the 2015 Victorian Premier’s Literary Award for an Unpublished Manuscript and was the subject of a bidding war between publishers. The film rights have already been optioned by Reese Witherspoon (who is proving to have exceptional taste in books). The advanced reading copies have been sent out six months in advance with the cover proclaiming it “the book of the year 2016”. I am a huge cynic when it comes to statement like that from publishers but let me tell you, everything you hear and will hear about this book will be true. This book is amazing, addictive and will have you gripped, not just until the final page but the very last word. The Dry is set in the small rural township of Kierwarra. A town on the brink after two years of drought which is rocked to its core after the murder/suicide of a farmer and his family. Aaron Falk reluctantly returns to the town to attend the funeral. Aaron and his family left twenty years ago vowing never to return. His return stirs up discontent that is already swirling through the town. When he begins to take a closer look at the circumstances surround this horrific crime his presence and his digging hits a raw nerve with many who thought they’d seen the last of Aaron Falk and will do anything to keep it that way. Jane Harper’s narrative sinks it’s teeth into you from the prologue and never lets go. She keeps you constantly guessing about what really happened and who is and isn’t involved. Each chapter leaves you dying to find out what happens next and more than one chapter will end with you gasping out loud. The closer you get to the book’s conclusion the whiter your knuckles holding the book become as the suspense builds and builds. The brutal heat that engulfs the town also permeates every page as does the petty-mindedness that comes from a small town and with a long history of grievances and its own sense of justice. This is an incredible debut that would be the envy of many established writers. I can’t wait for this book to hit the shelves. It is going to be huge and deservedly so. The Dry is undoubtedly one of the books of 2016 and I can’t wait to see if anything else gets close. You’re going to think I’ve lapsed into hyperbole, ladies and gentlemen, but the truth is, I’ve anything but. 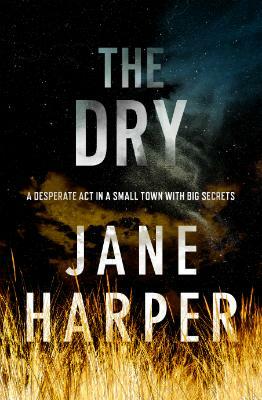 In fact, I’m cutting right to the chase, because if you take only one thing away from this review it should be this: until further notice, Jane Harper’s The Dry is the year’s best achievement on the Australian crime writing scene. As far as debuts go, it’s one of the best I’ve read — ever. And as a (newly reappointed) bookseller, it’s a book I can’t wait to put in people’s hands and hearing their reactions the next time they’re in store; probably the next day, because it’s the kind of novel that’ll induce an acute case of binge-reading. The small rural town of Kierwarra is on the brink. Haunted by its past, and more recently impacted by two years of severe drought, the town is struck by an even greater tragedy following the murder / suicide of a farmer and his family. Federal police investigator Aaron Falk reluctantly returns to his hometown to attend the funeral of his childhood best friend, and his presence immediately stirs latent discontent and animosity amongst certain folk. He might now carry a badge, but there are plenty of people in Kierwarra who’ve never forgotten, and certainly never forgiven Falk, following the suspicious death of another childhood friend. Now he’s back, and digging deeper into the murder/suicide, and unearthing the town’s dark secrets from its past and present. From its prologue, The Dry latches hold of the reader and doesn’t let up. Aaron Falk remains an enigmatic protagonist throughout; on the one hand, we support his mission for the truth; on the other, we’re forced us to question his involvement in the death of his friend years ago. The plot twists with an assuredness that belies Jane Harper’s ‘greenhorn’ status as a novelist. Her years as a journalist have clearly stripped away the common mistakes made by debut authors. There is a sparseness to her prose, which is complimented by characterisation and a plot of great depth. Frankly, if her writing was any sharper, it would cut. The Dry is a stylish, compulsive whodunit that will keep even the sagest mystery reader asking questions until the very last page. And by then, you’ll be gasping.